Many are billing the NextSeq 500 as a genome-scale machine in a benchtop size box. However, let’s look at the stats . The best output you can get from a NextSeq 500 is 120Gb, which is one human genome at 40X coverage. But who wants to do one human genome? By my calculations, 120Gb gets you about 35 exomes (assuming a 60Mb capture @ 40x and 70% on target). Again, who is doing 35 exomes? To find causal links to disease, you need to be doing 1000s of exomes. Illumina state that the NextSeq 500 is for “everyday” exomes. I assume this means the clinical market, but I remain to be convinced this is the best route. Contrast this with the high output mode of the HiSeq 2500, recently given the 1Tb upgrade. That’s 1000Gb, or 8 times the output of the NextSeq. That’s 8 human genomes, or ~290 exomes. Clearly the HiSeq 2500 is better for medium- to large- scale projects. Then there is time – the NextSeq takes 30 hours to get to 120Gb and the HiSeq 2500 takes 6 days to get to 1000Gb. So in theory you can run the NextSeq five times in the same time it takes a HiSeq 2500 to run (though you will be in the lab at some very strange times) – but this still only gets you 600Gb compared to the 1000Gb the 2500 is giving you. There is no real difference in costs for the sequence data, so I’m left asking myself – why would you buy a NextSeq 500 when you can buy data from someone with a HiSeq 2500? The NextSeq 500 has one flowcell with four lanes, whether run in rapid or high-output mode. The HiSeq 2500 has 2 flowcells of 2 lanes in rapid run, and 2 flowcells of 8 lanes in high-output, and each flowcell can be run independently. This means you can configure the HiSeq 2500 to run 2 lanes, 4 lanes, 8 lanes or 16 lanes. Given you will multiplex multiple samples in a lane for most experiments, the HiSeq 2500 clearly provides far more flexibility. If you really want to get into NGS then the MiSeq has just dropped to between £60-70k. This little beauty will give you 25 million reads at a variety of lengths and excellent quality. It’s not as high-throughput as the NextSeq 500, but as I’ve discussed in point 1 above, the NextSeq 500 isn’t really high throughput. Perhaps the best option is for labs to buy a MiSeq for small-scale and then outsource their medium- to large- scale projects. The MiSeq is a beautiful machine and will deliver 2x300bp reads of amazing quality. We’ve been promised 2x400bp reads for some time, and I personally cannot wait. For long reads of Illumina quality, the MiSeq is the weapon of choice. 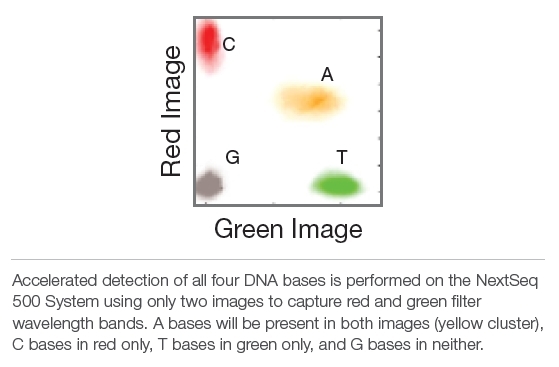 The NextSeq 500 has a new two-dye system for measuring base-incorporation, with red dye measuring C, green dye measuring T, a mix of dyes measuring A and no dye measuring G. I think it’s the latter two that are causing most concern. I’ve little doubt that this new system will introduce bias. Sure, it will probably be solved by chemistry and software upgrades, but when? Firstly, the cost of a NextSeq isn’t $250k, because you will need a library technician, a bioinformatician, some compute and some data storage, so start thinking more in the “$500k start-up and $250k per year” ball-park. I am sure there are better things you can think of to spend your money on! Secondly, you don’t have to spend $250k because you can already buy Illumina sequence data, and there are many reasons why you should out-source this particular part of your scientific research. So all in all, I am confused by the NextSeq 500. As I have said before, I think it is designed to compete with the Ion Proton, but looking at the statistics, I am not sure which niche in the market it really fills. Comments welcome if you care to educate me – is anyone planning to buy a NextSeq 500? I’d love to hear from you!